An angry jury is all about concepts around verdicts, guilt, innocence and judgement. 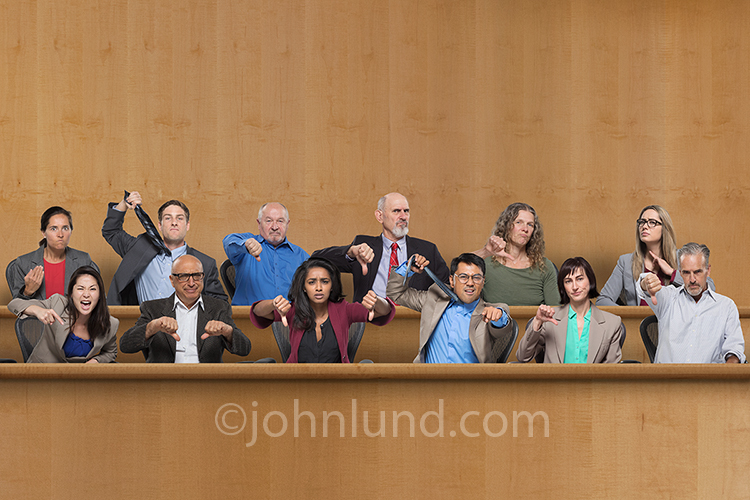 A Jury, in the jury box, is demonstrating their intent for a guilty verdict by making over the top gestures and facial expressions such as thumbs down and imitating nooses with their ties. Their expressions are angry and the outcome is obvious. The strengths of this image lie in it’s humor, its familiarity, and its obvious concepts. The image is about judgment whether that judgment is about products, services, or even political issues. In this case the judgment is obviously a negative one…that an advertiser can use to malign the competition or show how their product can alleviate or eliminate unfavorable opinions. Juries are something we are all familiar with from being called for jury duty to the numerous television shows that deal with the legal world. There are some great and emotional words that go along with the image such as “guilty”, “verdict”, and “innocent”. The image can work as a vertical crop, though by cropping out some of the jury members, and offers ample copy space for headlines and body copy. It can actually apply to a huge number of situations depending on the creativity of those using the image. As I didn’t have access to an actual jury box, I created the box by adding highlight and shadow to wood paneling I photographed in a high-end corporate office. I photographed each model separately…and in a variety of positions. I created several versions, and ultimately will no doubt add further variations over time. , the shocked jury, and the jury using VR (virtual reality) headgear. In fact, after completing this series of jury shots I immediately followed up with an animal jury of cats and dogs. Maybe down the road I will do a robot jury…kids would be good as well. Lots of opportunity here...maybe I should get back to work! Jury is a respected name because they have right to take a right decision for victim's family. Actually I provide Dissertation Help and I wrote an article in this topic.